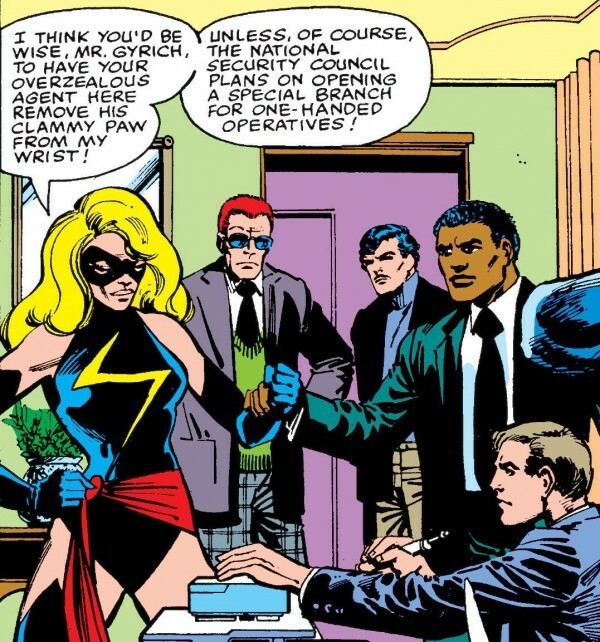 Early in her career as Ms. Marvel, one of US government operative Henry Gyrich's aides, whose name was given as Jenkins, grabbed hold of Carol Danvers' wrist, much to her annoyance. This plot point would be referenced again later, as seen in the following picture, and in the next panel below. So later on, the government agent Jenkins turns up again as a guard, whom Ms. Marvel identified at the time she was called Warbird. I'm sure this wasn't a great day for the guy, but a great one for the gal, reminding him of a time when he originally irked her, even if later, she could take it with pride. 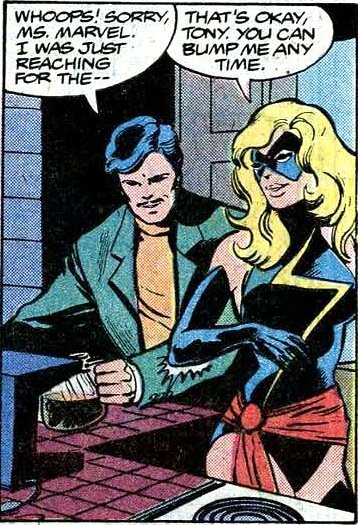 In this older panel, Tony Stark, Iron Man extraordinaire, was making coffee and accidentally bumped Carol's elbow. She actually liked this. 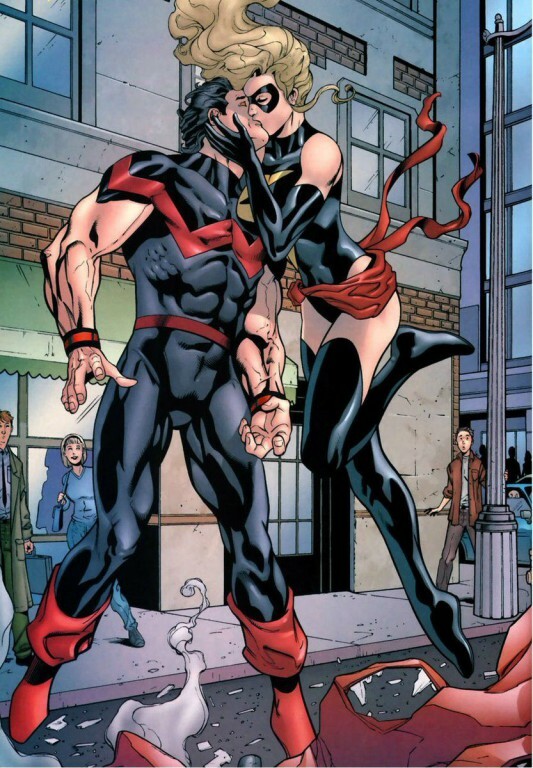 She also loved kissing Simon Williams, Wonder Man extraordinaire, following a battle with some crooks in the streets! 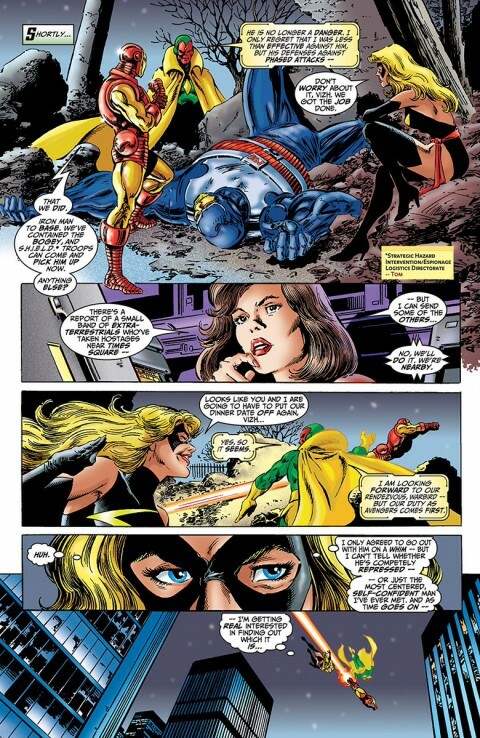 Here's Carol, Iron Man and Vision communicating with Wasp after felling an enemy robot in the pages of Avengers.